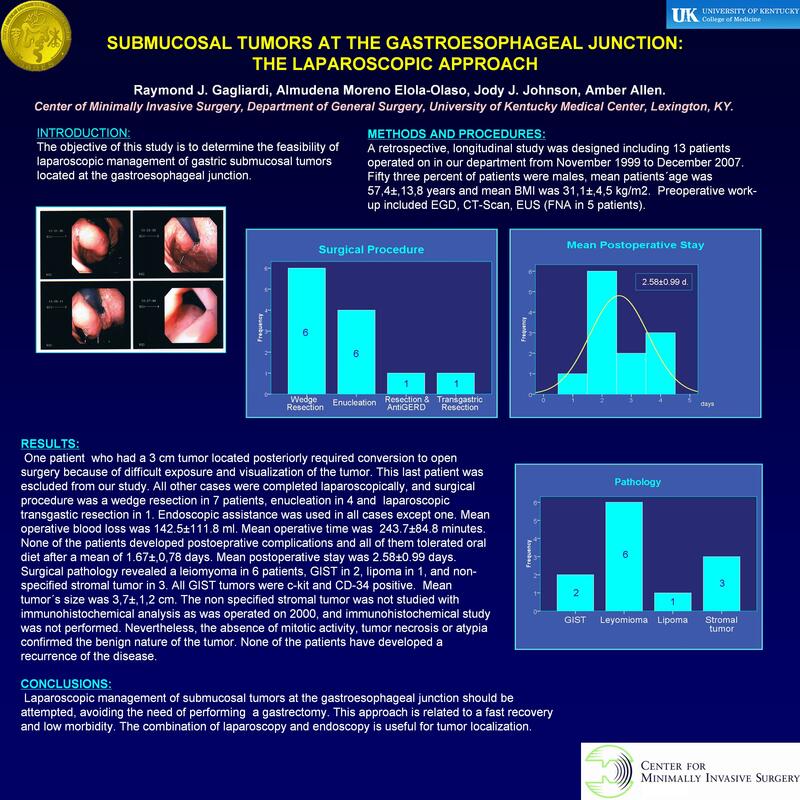 Introduction: The objective of this study is to determine the feasibility of laparoscopic management of gastric submucosal tumors located at the gastroesophageal junction. Methods and Procedures: A retrospective, longitudinal study was designed including 13 patients operated on in our department from November 1999 to December 2007. Fifty three percent of patients were males, mean patients´age was 57,4±,13,8 years and mean BMI was 31,1±,4,5 kg/m2. Preoperative work-up included EGD, CT-Scan, EUS (FNA in 5 patients). Results: One patient who had a 3 cm tumor located posteriorly required conversion to open surgery because of difficult exposure and visualization of the tumor. All other cases were completed laparoscopically, and surgical procedure was a wedge resection in 7 patients, enucleation in 4 and laparoscopic transgastic resection in 1. Endoscopic assistance was used in all cases except one. Mean operative blood loss was 142.5±111.8 ml. Mean operative time was 243.7±84.8 minutes. None of the patients developed postoeprative complications and all of them tolerated oral diet after a mean of 1.67±,0,78 days. Mean postoperative stay was 2,58±,0,99 days. Surgical pathology revealed a leiomyoma in 6 patients, GIST in 2, lipoma in 1, and non-specified stromal tumor in 1. All GIST tumors were c-kit and CD-34 positive. Mean tumor´s size was 3,7±,1,2 cm. The non specified stromal tumor was not studied with immunohistochemical analysis as was operated on 2000, and immunohistochemical study was not performed. Nevertheless, the absence of mitotic activity, tumor necrosis or atypia confirmed the benign nature of the tumor. DUring follow-up none of the patients have developed a recurrence of the disease. Conclusions: Laparoscopic management of submucosal tumors at the gastroesophageal junction should be attempted. Wefge resection and enucleation are sefe procedures, avoiding theneed of performing a gastrectomy. This approach is related to a fast recovery and low morbidity. The combination of laparoscopy and endoscopy is useful for tumor localization.